Lovestruck Summer is, needless to say, the perfect summer read. It's ideal for those long, lazy, and humid days when you want nothing but to sit in front of a fan and crack open a good book - one that will make you laugh and twist your stomach with anticipation and give you the butterflies of swoon. Lovestruck Summer has all this and more, so, perhaps its only flaw lies in that I picked this up in the middle of winter. Or towards the end of winter, huddled in blankets and with a mug of warm coffee near me instead of a drink of cool lemonade. Still, regardless of what time of the year you read this, it's bound to be the type of book you just can't help but immerse yourself in and emerge from it, completely lovestruck yourself. One of the most difficult aspects of this novel is, hands-down, its protagonist Priscilla - sorry, Quinn. From the very beginning, it is obvious that Quinn is a flawed character - which I loved. In fact, she's more-than-a-little judgmental, immediately categorizing her cousin, Penny, who she's spending the summer with in Austin as a sorority girl - a term she uses with much disdain. In the same breath, Quinn creates for herself the ideal summer in Austin, one where she interns, finds a fling who loves the same music as she does, and spends the whole summer rocking out to her favorite band, the Walters. Russ, the attractive cowboy frat-boy who lives next door definitely does not factor into her plans. Neither, it seems does finding that her cousin may become a friend or that country music isn't all that bad. Clearly, Quinn's summer is about to become a lot more different than she thought it would be. You'd be hard-pressed to find a reader who wouldn't enjoy Lovestruck Summer. Although Quinn can come across as extremely judgmental in the beginning, her voice is never too overbearing or shallow, having just the right amount of sincerity and genuineness for us to enjoy her narration. Plus, this gives room for plenty of gradual growth throughout the story as Quinn is forced to emerge from her tight spheres into larger ones, all thanks to Russ. But, more about him later. In addition to Quinn's own personal growth, though, much of this novel focuses on the blooming friendship between Quinn and Jade, another teenage girl who works as an intern along with Quinn. While both girls share inherently similar tastes in music, Jade is far more accepting of differences and she, too, forced Quinn to look beyond the surface of her cousin and find a friend within. For me, there's nothing better than a solid tale of friendship and, on that front, this novel definitely delivers. What's a good summer, though, without romance? When Quinn first arrives, she immediately identifies the perfect boyfriend for herself - Sebastian. Although it's immediately obvious to the reader that Sebastian clearly isn't the right person for Quinn, Quinn herself fails to realize this. If anything, she's too busy complaining about Russ, the neighbor who somehow manages to get on her nerves and won't stop calling her 'Priscilla' instead of 'Quinn.' Even more, he makes her listen to country music and hand-in-hand with these qualities, he has moments of pure kindness. As Quinn's feelings for Russ deepen, so do ours until - you guessed it! - drama-lamas arrive. Unlike most contemporary romances, though, I didn't find the drama in this to be overwhelming. It was kind of necessary, in my eyes, to give Quinn that extra time to grow on her own and make decisions for herself, not because of circumstance, so all-in-all, I can't say I have too many qualms. Yet, where my issues do come in is within the slight idealistic-ness of some of the situations in this novel. As I said in the beginning, this is a novel meant to be read on a long, lazy day when your brain is too fried to pick apart at the happy-go-lucky nature of this story. First and foremost, some of the scenes in this novel are just too perfect. It's as if they're out of a fairy-tale date, which is all very nice in theory, but I found myself simply rolling my eyes once or twice. Furthermore, the characters do lack some depth. While Quinn herself is fairly fleshed out, some of the other characters, even Penny and Russ, seem to have no other life except that which Quinn witnesses. Quinn herself never speaks to her parents too much and any real adult figures are all conspicuously missing in favor of a "fun-filled" summer. Frankly, though, these are very minor problems with a novel that is in equal parts fun as it is engaging. Just to add to its impressiveness, though, Walker finishes this novel off with an achingly realistic and hopeful ending, one which really sealed the deal on my rounded-up rating. Without a doubt, I wouldn't hesitate to recommend this, even to typical non-fans of contemporary romance and am already looking forward to my next read by this author. I've been wanting some lighter, funner reads just because I've been reading so many heavy ones. I've read one book by Melissa Walker and liked her writing style. Wonderful review! What is it about summer that just screams contemporary? I mean, I have that feeling and I don't even read much of it! This does sound like a wonderful summer read...a bit fluffy maybe with its idealism, but sometimes that's perfect for when the mood strikes. I'm worried about these drama-lamas you mention. My tolerance for romantic drama is lessening with each book I read it seems (which is totally my problem and not the book's), but if you say it's not overwhelming then I believe you:) I do like the sound of Quinn's growth and her romance with Russ, so I'm adding this to my summer vacation list! I've wondered about this book! I've LOVE LOVE LOVED Walker's UNBREAK MY HEART and SMALL TOWN SINNERS so, so much but they don't lack any depth to the characters at all, in my opinion. So this must indeed me one of those summer-y type of reads. (Even the cover looks that way.) The thing about going from great books like the ones I've mentioned above to these easy, breezy titles is that sometimes I get a little bit disappointed even though I realize what I'm getting into. This DOES sounds really great to tuck away for a perfect summer read when I need one. Thank, Keertana, because I've never seen a review of this one before and I have been wondering about it! I do love this author. I actually laughed when I read "drama-lamas" Keertana! This book sounds like it'll be a great summer read. For some reason Quinn reminds me of D.J. from Dairy Queen. Quinn's voice (from your review) sounds like D.J. I'm not sure if I'll pick this one up, but if I do I'll make sure to let you know :). 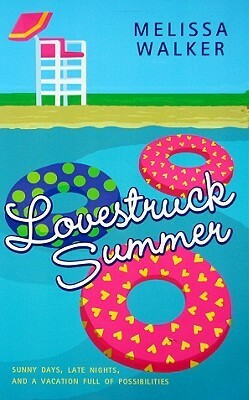 Lovestruck Summer is actually one of my favorite reads, since it soooooo reminds me of my first summer away from home. (And Quinn's attitude may or may not have kind of reminded me of myself at that age.) It really is an ideal summer read. I know this cover is misleading and that people seem to love this book! It does sound like the perfect summer read. I'm glad you liked it, even with your problems with Quinn. Great review! I read a lot of these summer books for their romances, I have to admit. Plus it's nice to give my brain a rest and indulge in some light fun, even if it is a little too perfect. I like the sound of this book overall! Great review, Keertana. I wish that we could make it summer by reading enough of these beach reads. Even the setting in Austin makes me wish it were hotter. I will definitely store this title away for a summers day. I love contemps that make me laugh and contain a bit of drama, especially if they feature hunky cowboys. And if your biggest complaint is that it is too perfect in places, that's high praise from you. Great review.